Customise a Dater or Numbering self inker stamps with text or your logo. Choose either tough plastic framed self inkers or for high volume use the heavy duty metal framed self inkers . The dates or numbers are easily rotated manually. 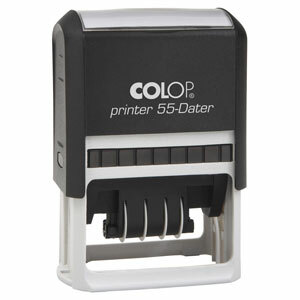 A multi-purpose plastic self-inker for daily use. Choose from over 20 different sizes and simply design either a round or rectangle dater. Dater stamps come with 10 year changeable bands and will produce 1000’s of stamping impressions before replacement ink-pads are required. Heavy duty metal framed daters for constant daily use for many years. Prices shown include the cost of your custom made design. Dater stamps come with 10 year changeable bands and will produce 1000’s of stamping impressions before replacement inkpads are required. A lighter weight and economic alternative to the Colop heavy duty metal framed self inker - which make these daters ideal for office use. Dater stamps come with 10 year changeable bands and will produce 1000’s of stamping impressions before replacement ink-pads are required. 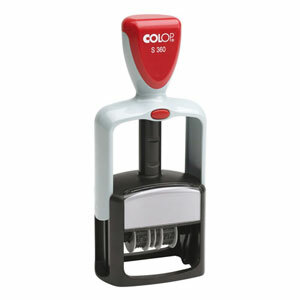 Colop Self inking Numbering stamps customised with text and logos. Heavy duty plastic or metal framed self inkers designed to last many years. Easy Manual rotation of the numbers.